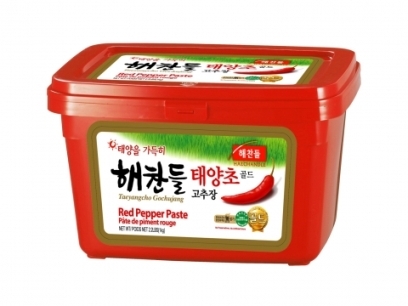 The most difficult part about this dish is finding the Korean red pepper paste called gochujang. 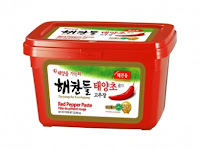 This is the one that I used and I found it at my local Asian grocer. Start off by cooking the rice as you normally would. Wisk together all the ingredients for the sauce, the gochujang, honey, rice wine and soy sauce and stir in the turkey mince. Leave for about 5 minutes. Meanwhile heat a little oil in a wok, add the peas and spring onions and cook for 3 minutes. Add the turkey mince and cook for about 4 minutes until the turkey is cooked through then add the rice wine and a couple of tables poons of water and stir for an additional 60 seconds. Then serve over rice with some chopped coriander. That is it! Since I am not a big follower of Korean cuisine, I'd like to comment on quality of the pictures on this blog. They truly are mouthwatering and make me want to run and get a knife and a fork. Well done, Malvina.